This is a super cute and quick print-and-go craftivity for kids! They get to cut out and color the Day of the Dead skull (calavarita para Día de Muertos) and then stick on a fat popsicle stick or paint stick. Day of the Dead (Día de los Muertos) is a holiday celebrated in Mexico, around Latin America, a few countries in Europe, the US, and the Philippines. In Mexico, skeletons are decorated, dressed-up, and given personalities and activities. 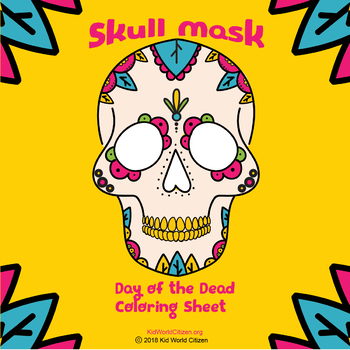 This whimsical coloring sheet features a skull waiting for decorations! Children can use crayons, markers, paint, sequins and glitter to decorate the sheet. For a full range of beautifully designed, Common Core aligned activities, check out our Holidays around the World: Day of the Dead Unit ! You'll find Day of the Dead math activities, a book list and introductory presentation, a reading with comprehension questions, handwriting sheets, a gorgeous minibook, amazing decorations for your classroom, and more!